EZ-Gro Betaine is an osmo-protective agent intended for use in home garden, greenhouse and field. Its active ingredient, glycine betaine, is a natural compound that functions to protect plants from abiotic stress. Conditions like drought, heat, cold, and salt stress cause dehydration and can have a severe impact on crop yield. Osmo-protectants combat these debilitating conditions and improve plant growth and survival. By altering cellular structures and membrane composition they allow plants to adapt to water deficiencies. Studies show that exogenous glycine betaine can be taken up by plant roots and accumulate in leaves, offering normally fragile plants the same protection as those resilient varieties. 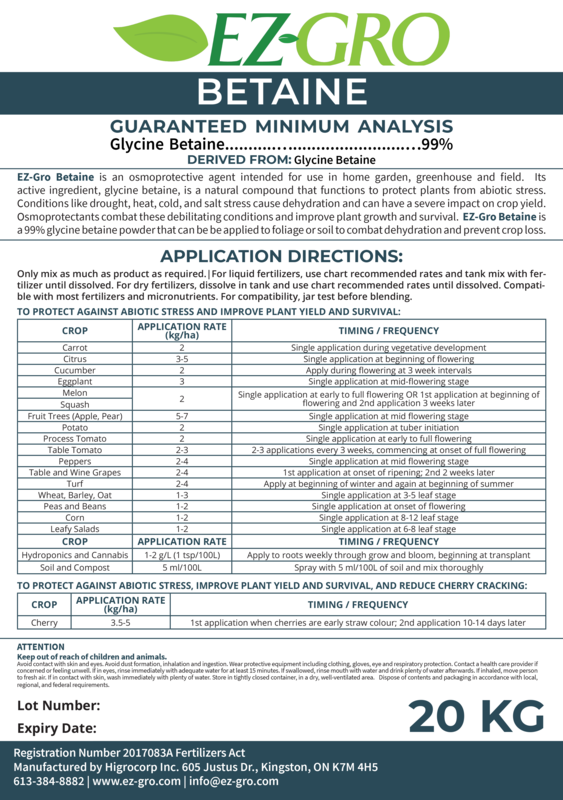 EZ-Gro Betaine is a 99% glycine betaine easily dissolved powder that can be applied to foliage or soil to combat dehydration and prevent crop loss. • Betaine promotes growth under stressed conditions – heat, drought, salt, cold etc.